Have you ever saved money to buy a particular beauty product? I have, quite a few times, especially during my college days. And even after saving, spent days and nights thinking “whether it is actually worth buying”, “whether I actually need it in my life”, etc. 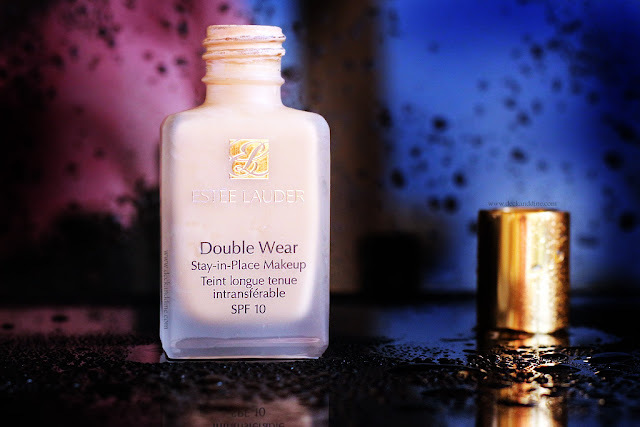 Anyway, after many such brutal wars in between my mind and heart, finally and as usually the heart own and I bought my first ever bottle of Estee Lauder Double Wear Stay in Place Foundation. The decision to spend money on something I seldom wear was difficult to take, but this was in my wish list since long and couldn’t be happier. 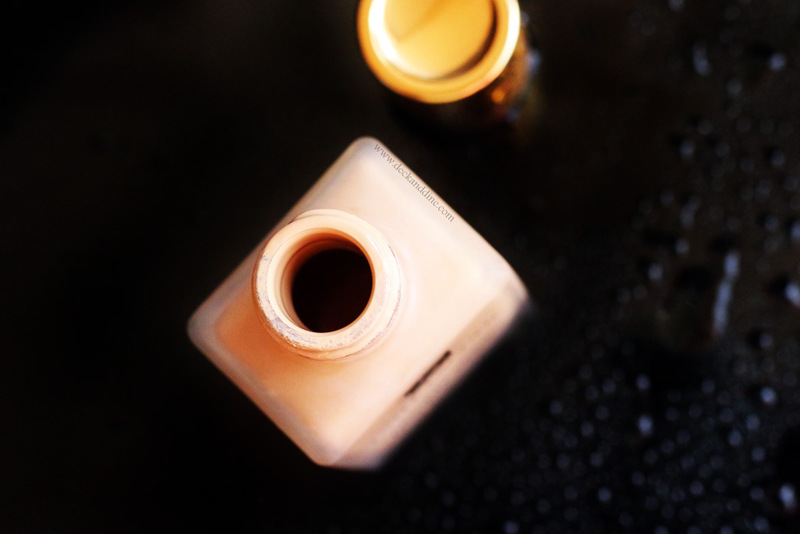 The foundation comes in a frosted glass jar with a golden screw cap. The bottle feels and looks luxurious. The glass bottle further comes housed in a violet box with all the details mentioned on it. 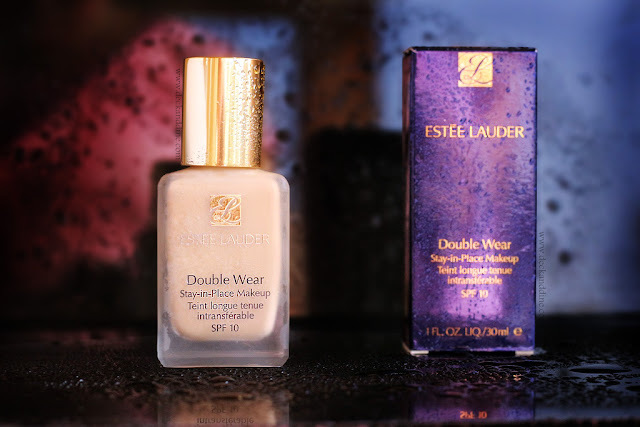 My Experience with Estee Lauder Double Wear Stay in Place Foundation in 1W2 SAND. Lets start with a detailed analysis of my skin: I am fair (NC20 in MAC). I don’t have acne or pimples currently, but have a bit of scarring left by ex-pimples. There is slight discoloration on the side of mouth and forehead area. 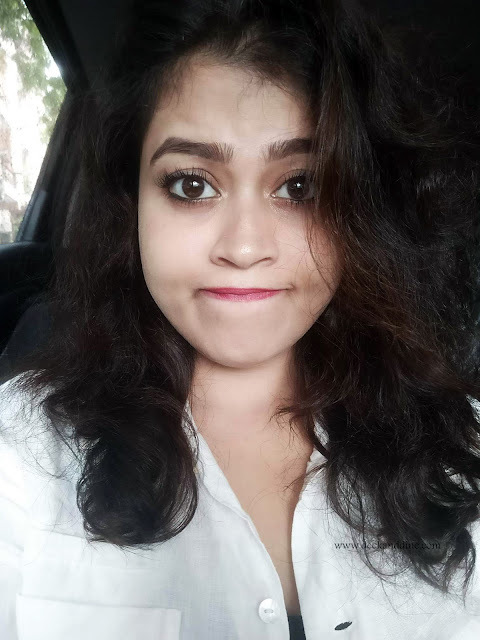 My skin is normal which goes dry in winters. 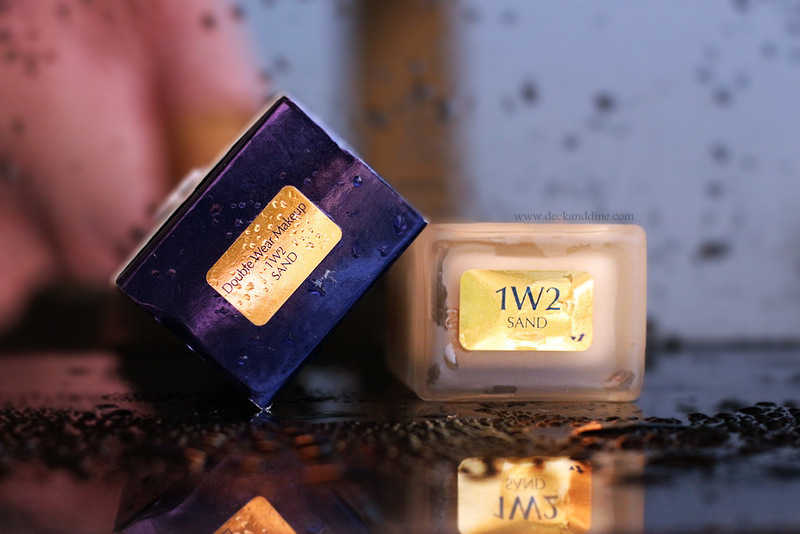 I am in shade 1W2 SAND and Estee Lauder describes SAND as “soft beige with warm to yellow undertones”. This particular shade is for fair-light skin tones and suits my NC20 skin beautifully. There are total 56 shades, so finding the correct shade for you won’t be a problem. It has a medium consistency, slightly on the thicker side, feels very smooth and is easy to blend. The finish is polished matte and it sets almost instantly, so you have to work fast blending it well into the skin. As the finish is matte, a clean, well prepped skin is indispensable. Otherwise it might go streaky, might look unblended and will just sit on top of your skin instead if melding with it. I use this foundation over my usual moisturizer and spreads beautifully, giving a nice blended look without sitting on top of the skin. Coming to the coverage, it has a medium to high coverage and it does, cover and conceal amazingly. As it has a high coverage, one can go overboard easily and end up with a cakey, plastic like face. So you have to keep the quantity in mind. Start with a little and build up slowly. Know where to stop. When applied in a thin layer with damped beauty blender, it could actually look pretty natural. True to its name, it stayed in place all day, without transferring or fading and didn’t seem to visibly sink into my pores or fine lines even though I didn’t use primer.It is great for Indian summers, the finish doesn't make your skin look sticky and sweaty. Blends easily and settles quickly. Covers and conceals redness, marks and scars beautifully giving a smoother looking skin. Doesn’t highlight wrinkles or patches if skin is well prepped. The packaging though looks classy, is not at all travel friendly. Once I travelled with it inside my handbag. I made sure that the cap was tightly shut, but it leaked during travel leading to product wastage. Also while pouring the product, I pour more than required and putting it back is messy and unhygienic. I wish it came with a pump dispenser. 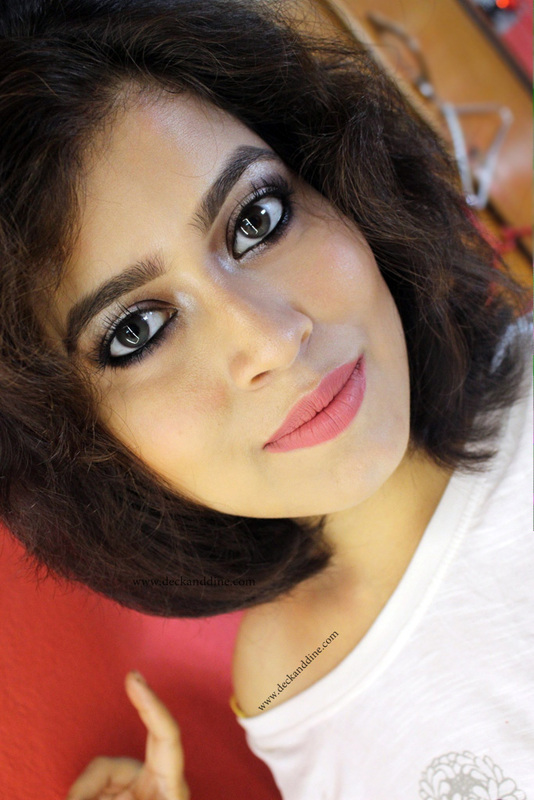 I am not someone who likes foundation with high coverage or with absolute matte finish. This foundation has both and absolutely loving the foundation. I don’t how and why, but slowly I fell in love with it. I might sound like a teenager, experiencing love for the first time, but this is basically how I feel. I love how it conceals imperfections, gives an even and smooth finish, yet looks very natural; I love how it feels and looks throughout the day. I was in a double mind before buying this foundation, but I am very glad I took the step and finally bought it. Whenever I need to wear foundation, my hands automatically reach to it. I have been trying a lot of foundations out there looking for THE ONE and I guess I have finally found it. There is something about this foundation. This photographs beautifully as well. I would highly recommend it if you are looking for high coverage, long staying foundations with a matte finish. Just keep your skin well moisturized and well prepped. The vast range of shades helps you to pick your correct shade as well. So go and get yourself one. You won’t regret. Which is your favorite foundation? Have you tried Estee Lauder Double Wear Stay in Place Makeup? 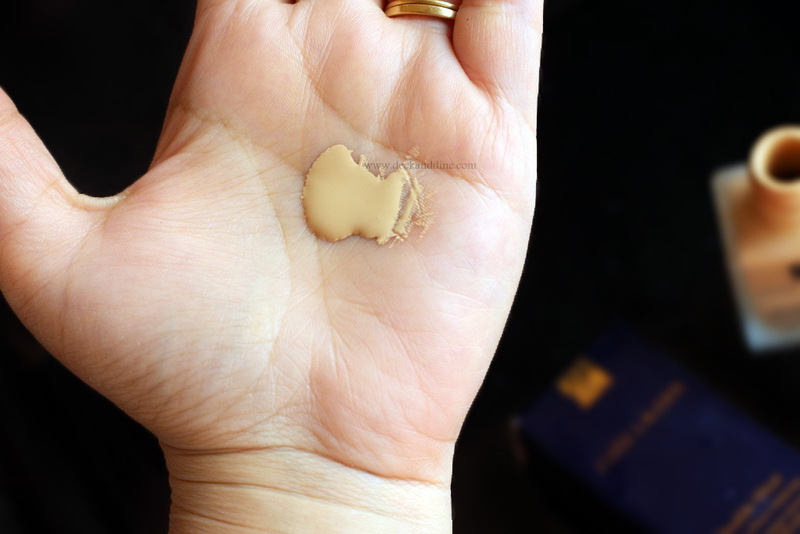 I'm so glad you found your HG foundation. It looks great! 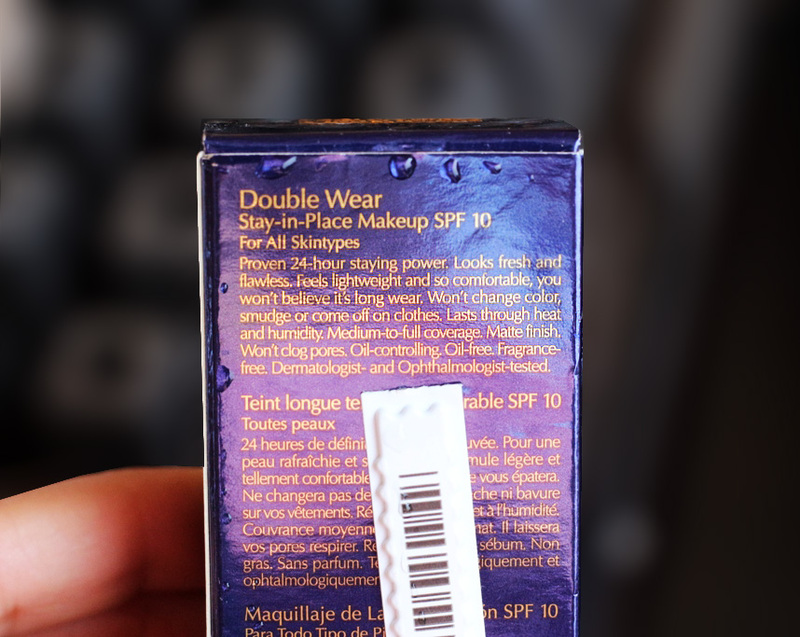 Sadly, DoubleWear isn't for me with my super dry skin. I had a makeover at an EL event a couple of years ago, and the MUA used it on me and it practically cracked on my skin. Oh well. I only buy EL when there's a gift with purchase but I haven't done that in a long time. I'm glad you said it was fragrance free since that's why I stay away from the brand. This sounds like a great foundation. I love a medium-full coverage matte finish. So unfortunate you can’t travel with it. That would be a downer for me. That's a great color match for you! Gosh the packaging is super beautiful. I didn't realize they had so many shades! That is a lot of shades, I bet everyone actually can find something to work for them! That looks really nice on you! I do love a good full coverage foundation, particularly for when I am performing on stage. For all the shade options, none really suit me. For low to medium coverage foundations, close is usually enough as I contour so it works, but full coverage really shows how badly things match on me. I really wish this foundation came with a pump — I feel like that’s not asking too much, considering the price. But I do really love how it looks on my skin, so I still own and love mine!